Last weekend, as a belated nod to Chinese New Year, I decided to stock up on dumplings. Once in a while, I make a big batch of these bite-size wonders and freeze them for future use. 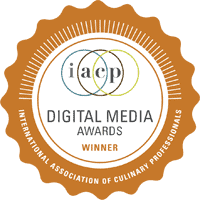 It’s a time-consuming task, but I find it relaxing and I’m rewarded with many great meals to come. Whenever I want a quick & easy lunch, I take out exactly the number of bites I need, cook them from frozen and voilà, I enjoy their crispy and moist deliciousness. Industrially-made dumplings sold in the frozen section of Asian supermarkets are fairly popular and some brands are not too bad, but making them yourself is lots better, believe me. First, you control the thickness of the wrappers you’re using – nothing worse than biting a dumpling and discovering that it’s mostly made of dough, not filling. Second, you know exactly what you put in your dumplings: no fillers, no mystery ingredients, just goodness. 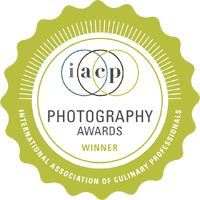 And you can play around with the ingredients and invent a new recipe every time! Another thing that I love about dumplings is that you can wrap them in many ways so they always feel different and new. The crescent shape is a classic so I always make some this way, but I also like to try new methods. This time, I tried a technique I first saw demonstrated by Chef Susur Lee which wraps shrimp filling in a such a way that it makes the dumplings look like little gifts. I also used a dumpling press that I paid less than $3 at the Asian market. The gadget was quick to work with but I found the dumplings it produced the least attractive of the bunch. You can fry and steam them, which turns them into potstickers (my favorite cooking method). You can boil and fry them, which also makes them potstickers. 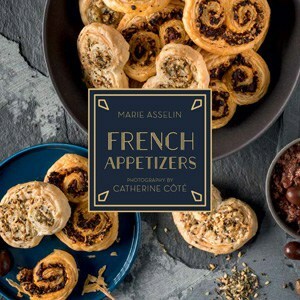 This method works especially well with classic crescent dumplings wrapped in thicker wrappers. For a lighter alternative, you can steam them using a traditional bamboo steamer or more modern accessories like a double-boiler or an electric steamer. I sometimes just throw them in a soup. Wontons are the meat-filled bites that are traditionally added to soups as they’re usually smaller and more delicate, but sometimes I just feel for a comforting soup so a handful of frozen dumplings added to hot broth make a hearty meal in a snap. 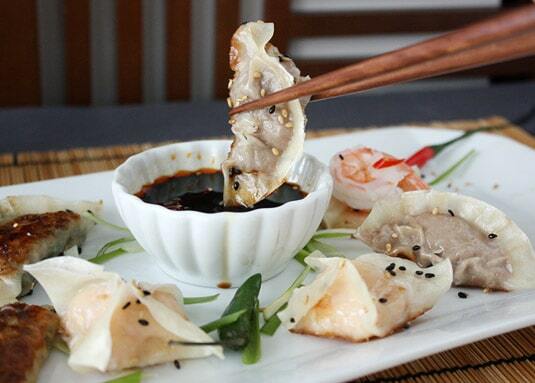 Dumplings are best served with a classic dipping sauce. Recipe below! 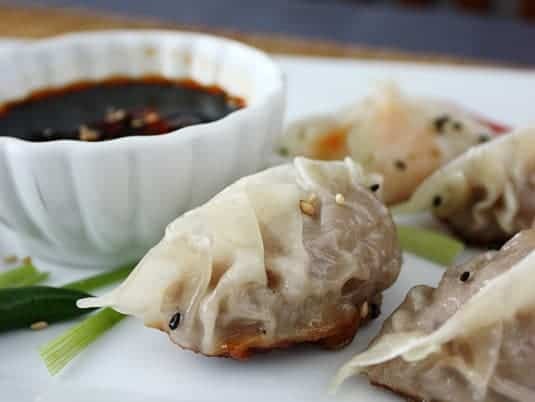 You can make your own wrappers, but I say that making the fillings and wrapping the dumplings is already a big endeavor so save yourself the trouble and buy a stack of pre-made round dumpling wrappers at the store (they are often kept frozen). These wrappers can be used as is, but I flatten them out because I like my dumpling skins to become glistening and translucent after cooking. Thin dumpling skins also fry crunchier (yum!). This technique is also recommended by chef Susur Lee. Sprinkle cornstarch on both sides of two (or up to four) wrappers and stack them precisely one on top of the other. Use a rolling pin to flatten the wrappers until they’ve become about 140% bigger. With a 3.5-inch round cookie cutter, cut out new wrappers. Discard the excess dough. Stack the new, thinner wrappers on a plate and cover loosely with plastic wrap while you work on the rest of the wrappers to prevent them from drying and cracking. There are several different ways to wrap dumplings, the most traditional of which is certainly the classic crescent shape. You can have fun and wrap them in many different ways; I like to use a different wrapping method per filling so that the different varieties are easy to recognize. 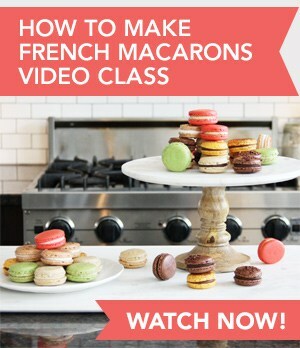 Because videos are tremendously helpful to learn new techniques in the kitchen (and because it was easier than try to explain it in words! ), I’ve put together a short video in which I show how to flatten dumpling skins, as well as three different wrapping methods: Susur Lee’s “bow” technique, the classic crescent shape and the flat half-moon shape. Watch below or click here to view the video in HD quality on YouTube (instructions will be easier to read!). The following three recipes were inspired by Susur Lee but I heavily adapted them to use ingredients that are easy to find. 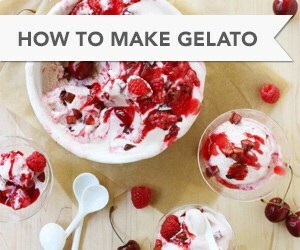 Feel free to use these recipes as a guide and come up with your own variations. You can use a wide variety of proteins as a base, such as duck, chicken, pork, beef, fish, crab or shrimp, or you can go vegetarian by using tofu or only vegetables. Other classic ingredients in fillings include cabbage, green onions, leek and chives. Seasonings can include sesame oil, soy sauce, oyster sauce, garlic, chopped hot peppers (or hot sauce), ginger, lemongrass, and lemon or orange zest. 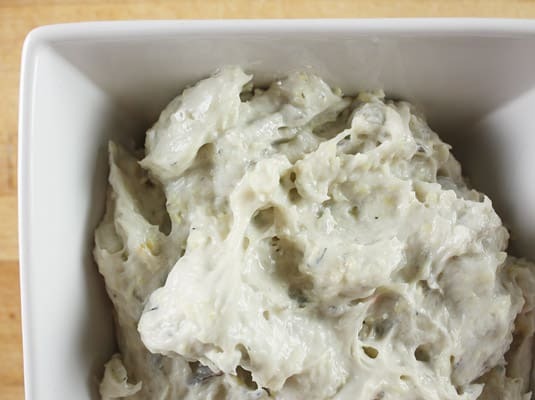 In a food processor equipped with paddle or dough attachment, combine all ingredients and beat the mixture on medium-high speed until it becomes pasty, about 2 to 3 minutes. Refrigerate until ready to assemble the dumplings. Raw shrimp filling looks a bit goopy but it cooks to a nice pink color. 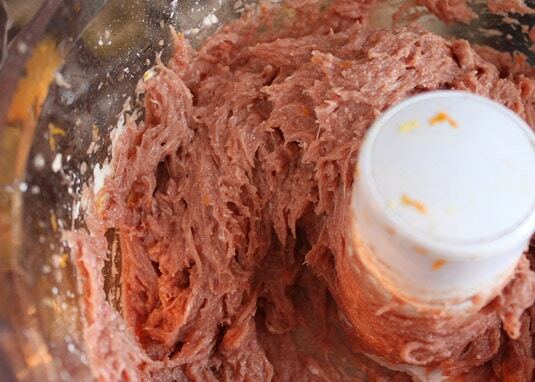 Texture of raw beef dumpling filling mixed in the food processor with the dough blade. You’ll have quite a lot of chopping to do to make this filling. Try and chop everything about the same size to produce a uniform and enjoyable texture. It’s recommended to degorge cabbage before adding it to the dumplings to avoid soggy wrappers. How-to: cut cabbage into small dice, sprinkle with 1 teaspoon kosher salt and let sit for 15 minutes then squeeze all the water out. Preheat a large sauté pan. Add vegetable oil, and cook ginger and onions until translucent. Next, add remainder of the vegetables except the chopped cilantro and two additional green onions, and sweat until the vegetables become soft but retain their shape (about 10 minutes). Deglaze with Chinese wine and reduce by half. Add oyster sauce and sesame oil. 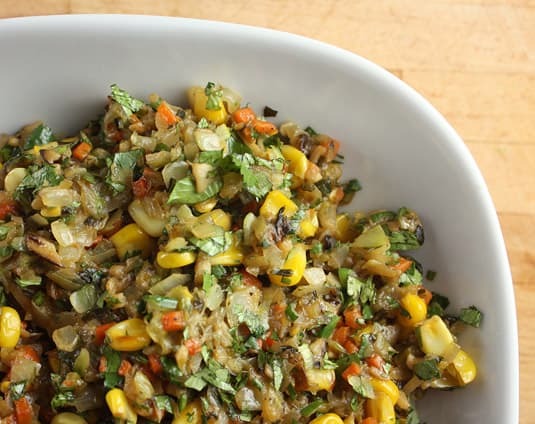 Thicken vegetables with cornstarch-water mixture and stir thoroughly to ensure cornstarch won’t clump up. Remove from heat and stir in cilantro and green onions. Taste and adjust seasoning to taste. Cool mixture completely before filling in dumpling dough. 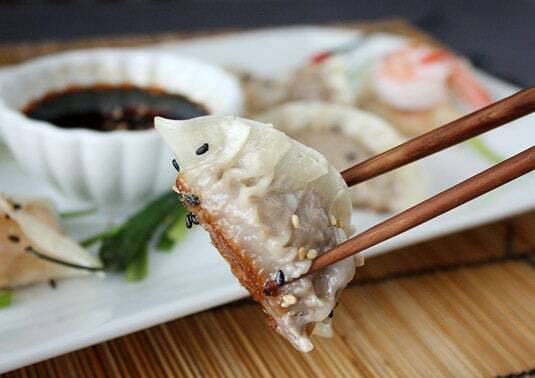 This method works with any kind of dumpling. I like to fry flat half-moon vegetable dumplings on both sides: turn them before adding water to the skillet. Heat vegetable oil in a skillet over medium-high heat. 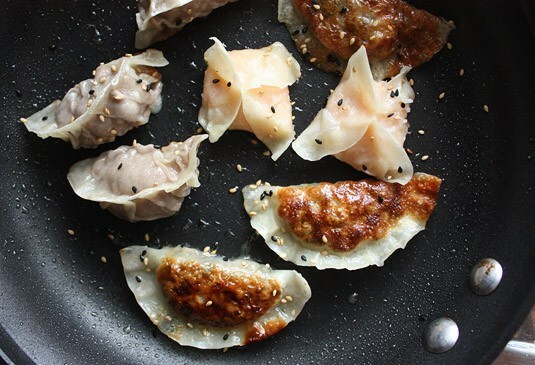 Fry dumplings until their bottom is golden and crisp, about 2 minutes. Add ¼ cup water for every 10 to 12 dumplings, cover immediately and steam for 3 to 4 minutes. Uncover and let any remaining water cook off. Serve very hot. Dumplings cooked with the Fry & Steam (Potsticker) method. 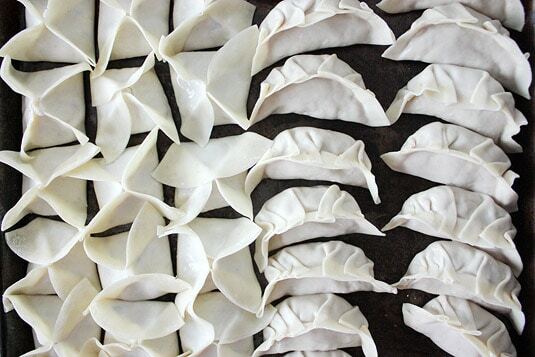 This method works best with thicker wrappers and crescent-shape dumplings. I wouldn’t boil delicate bow-wrapped or flat half-moon dumplings. Bring a big pot of water to a boil. Add dumplings (don’t overcrowd your pot) and simmer for 6 to 8 minutes. Heat up some vegetable oil in a skillet over medium-high heat. Fry boiled dumplings until their bottom is golden and crisp, about 2 minutes. Serve very hot. This method works best with thin wrappers. Heat one to two inches of water in the bottom of a wok until it simmers. Place a bamboo steamer over the water (the bottom of the steamer must not touch water). Place dumplings in the steamer and cover. Vegetable dumplings will be the quickest to cook (about 3 minutes), shrimp dumplings are ready after 4-5 minutes and beef take about 8 minutes. Follow the same instructions for a double-boiler. If using an electric steamer, follow the manufacturer’s instructions. 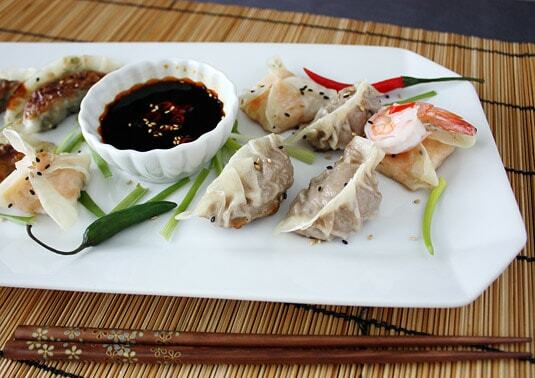 Mix everything together and serve in a small dipping bowl with the dumplings. 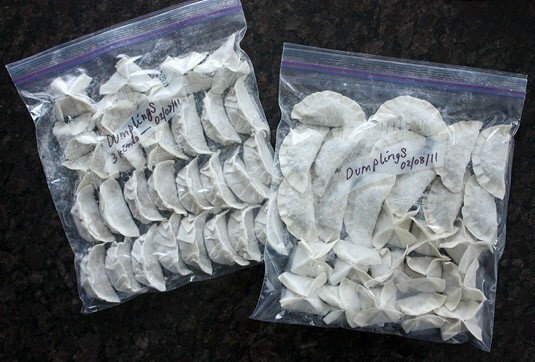 If you intend on freezing dumplings, do so as soon as possible. With time, the filling’s moisture will get through the wrappers and make them all sticky and soggy. If you freeze them as soon as they’re made, they will keep their cornstarch coating and remain easy to manipulate. As you make the dumplings, line them up on a baking sheet and as soon as one sheet is full, put it in the freezer. Once the dumplings are frozen hard (3 hours later minimum), transfer the dumplings to freezer bags and store until you have a craving for hot and crispy dumplings! I loooove homemade dumplings! But I’ve been struggling with one BIG problem. Whenever I freeze my dumplings the skin always seems to crack on at least half of my batch. I noticed it the first time when I forgot to transfer them to a freezer bag and instead left them on a cookie sheet in the freezer over night. Since then it seems no matter what I do I always have this cracking problem. Is my freezer too cold or not cold enough? Should the cookie sheet be covered when it first goes into the freezer? Does this ever happen to you? Any ideas on a remedy would be helpful! I always put Sarah wrap on the baking sheet first and never have cracking problem. can I use springroll’s wrapper as dumpling’s wrapper? are they different? Springroll wrappers and dumpling wrappers are not exactly the same. Springroll wrappers are usually larger and thinner and destined to be deep-fried. 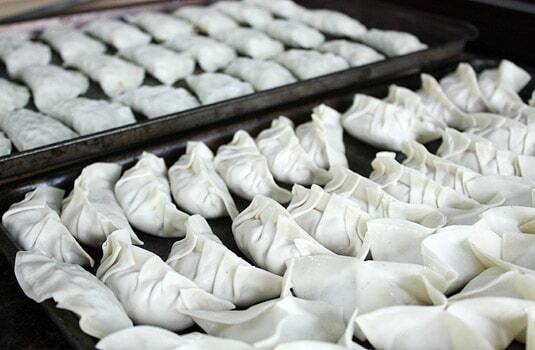 Dumpling wrappers are smaller, round or square, thicker and destined to be steamed or fried. Thanks a lot for all these practical tips. Did I understand correctly that you use frozen wrappers and then freeze the dumplings ? I was afraid to do so because you’re not supposed to freeze again something that was frozen. Hello Marie! You are raising a very interesting point. I know the refreezing rule, but I have to admit that I’ve never thought of applying it to dumpling wrappers! I’ve tried to research the question without finding a clear cut answer, but my feeling is that because dumpling dough only contains flour and water, the risk of it developing bacteria (the reason why refreezing is usually not recommended) is very low, if not inexistant. Do frozen dumplings need to be thawed before frying/steaming? What’s the best way to prepare the dumplings from the frozen stage? Hello Liz, keep the dumplings frozen until you’re ready to cook them. Proceed with whatever cooking method you prefer, adding about 2 minutes cooking time. Thank you so much for this article – you have so much detail here! I found your site looking for info on how to freeze dumplings. 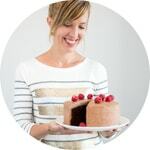 I plan on making my first ever batch tonight but I know I’ll have too many… Your guidance is fantastic, thanks! Wow, I love this post. I did one just like it a couple months back, sans the video. I am loving your content these days. I’m glad you’re back to posting frequently. I find myself being rewarded for coming back here every few days. Cheers. Oh, you made perfect dumplings Have you try to make dumpling wraps before? Thank you for celebrate Chinese new year. I like your blog. No, I’ve never tried to make my own dumpling wrappers before! I just had my pasta machine and I figured I needed a little more practice before making them myself. I know you can roll them out with a rolling pin, but since they’re so thin and delicate, I figured the bulk of the job could be done with the help of the pasta machine. Did you every try it before? Would you be so kind to give me your recipe? Since you’ve made them so often, I’m sure following your advice would be a great starting point for me. Oh my goodness, I can’t wait to try this out. I have ruined so many dumplings, but the time for lumpy and destroyed dumplings is over!